More news from last night's Nintendo Direct announcement event: While Pokémon Black 2 and White 2 are DS games, playable via the 3DS' backwards compatibility, there will be some apps released (in Japan, as of now) to enhance the 3DS experience. 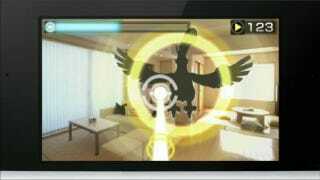 • Pokémon AR Searcher (pictured) is an AR shooting game Pokémon caught in this game can be taken into Black 2 and White 2. This will launch on the day the game releases, and will be available on the Nintendo eShop for ¥300. • Pokémon Zenkoku Zukan Pro, described as "an updated version of the Pokemon management program Pokemon Rittai Zukan BW is to be released on July 14 at ¥1,500. Andriasang reports this "is actually a replacement for Rittai Zukan BW, which will be pulled from the e-Shop on June 17." Nintendo also published this new trailer for Pokémon Black 2 and White 2. It's basically a cleaner, re-cut version of this one.